We carried out a systematic review of clinical studies investigating glucagon-like peptide-1 (GLP-1) secretion in patients with type 2 diabetes and non-diabetic controls and performed meta-analyses of plasma total GLP-1 concentrations during an OGTT and/or meal test. Random effects models for the primary meta-analysis and random effects meta-regression, subgroup and regression analyses were applied. Random effects meta-analysis of GLP-1 responses in 22 trials during 29 different stimulation tests showed that patients with type 2 diabetes (n = 275) and controls without type 2 diabetes (n = 279) exhibited similar responses of total GLP-1 (p = NS) as evaluated from peak plasma concentrations (weighted mean difference [95% CI] 1.09 pmol/l [−2.50, 4.67]), total AUC (tAUC) (159 pmol/l×min [−270, 589]), time-corrected tAUC (tAUC min−1) (0.99 pmol/l [−1.28, 3.27]), incremental AUC (iAUC) (−122 pmol/l×min [−410, 165]) and time-corrected iAUC (iAUC min−1) (−0.49 pmol/l [−2.16, 1.17]). Fixed effects meta-analysis revealed higher peak plasma GLP-1 concentrations in patients with type 2 diabetes. Subgroup analysis showed increased responses after a liquid mixed meal test (peak, tAUC and tAUC min−1) and after a 50 g OGTT (AUC and tAUC min−1), and reduced responses after a solid mixed meal test (tAUC min−1) among patients with type 2 diabetes. Meta-regression analyses showed that HbA1c and fasting plasma glucose predicted the outcomes iAUC and iAUC min−1, respectively. The present analysis suggests that patients with type 2 diabetes, in general, do not exhibit reduced GLP-1 secretion in response to an OGTT or meal test, and that deteriorating glycaemic control may be associated with reduced GLP-1 secretion. The online version of this article (doi: 10.1007/s00125-013-2841-0) contains peer-reviewed but unedited supplementary material, which is available to authorised users. The incretin hormone glucagon-like peptide-1 (GLP-1) is a 30-amino acid peptide hormone secreted by enteroendocrine L cells mainly located in the mucosa of the distal part of the small intestine and colon . Carbohydrate, fat and protein in the lumen of the gut have been shown to stimulate the secretion of GLP-1 [2, 3, 4]. GLP-1 is rapidly inactivated via enzymatic cleavage by dipeptidyl peptidase 4 (DPP-4), and only the intact form seems to retain biological effects in humans . GLP-1 acts as a glucose-dependent stimulator of pancreatic insulin secretion and at the same time it glucose-dependently inhibits pancreatic glucagon secretion . GLP-1 also curbs gastrointestinal motility, increases satiety and reduces food intake [1, 6]. Patients with type 2 diabetes are characterised by a reduced incretin effect, i.e. 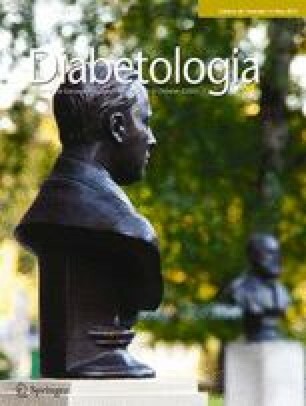 impaired amplification of insulin secretion during an OGTT compared with isoglycaemic i.v. glucose infusion . Impaired secretion of GLP-1 has been regarded as one of the potential mechanisms underlying this defect . However, in recent years, it has been debated whether GLP-1 secretion is in fact lower in patients with type 2 diabetes compared with matched healthy controls [8, 9]. The aim of the present study was systematically to compile all current data on plasma GLP-1 responses following oral glucose or mixed meal ingestion from clinical studies comparing patients with type 2 diabetes and matched non-diabetic controls. By performing meta-analyses (random effects and fixed effects models) with subgroup analysis and meta-regression analyses of the retrieved data we tested the hypothesis that patients with type 2 diabetes exhibit normal GLP-1 responses. Eligible trials were identified by electronic and manual searches in literature references. For the electronic searches, we reviewed the Cochrane Library, Medline, Embase and Web of Science. We made no restrictions regarding the trials’ language or year of publication. The search terms included ‘glucagon-like peptide-1’, ‘secretion’ and ‘diabetes mellitus’. These terms were adjusted to fit the requirements specified in each database. The last search update was 1 May 2012. Eligible trials were listed and the inclusion criteria were assessed independently by all authors. We excluded studies which used non-specific assays that cross-react with the major proglucagon fragment [2, 10, 11, 12], those which did not provide enough data  and those which dealt with intact GLP-1 only [14, 15, 16, 17, 18, 19]. Excluded trials were listed with the reason for exclusion. Two authors extracted data independently. We included studies investigating adult patients with type 2 diabetes and matched non-diabetic controls reporting plasma total GLP-1 responses (peak plasma levels and/or integrated responses and/or integrated incremental responses) following an OGTT and/or meal test. All included trials reported clinically relevant outcome measures and provided clear descriptions of GLP-1 secretory stimuli and the specific assays used for determining plasma GLP-1 concentrations. If applicable, we contacted the authors of the original publications to obtain additional data. Data analyses were performed using Stata version 11 (StataCorp, College Station, TX, USA). We used random effects models for the primary analyses because we expected clinical heterogeneity between trials (owing to different patient populations and intervention regimens). Results of the meta-analyses were expressed as weighted mean differences for continuous outcomes and relative risks for dichotomous outcomes, both with 95% confidence intervals and with I 2 values as markers of inter-trial heterogeneity. We repeated the meta-analyses, using fixed effects models, to test the robustness of the results after attributing less weight to small trials. We reported the results of the fixed effects meta-analyses if they differed from those of the random effects models. Regression analysis of funnel plot asymmetry allowed us to assess any evidence of publication bias and small study effects (Egger’s test). Subgroup analysis examined separately the GLP-1 secretion following either oral glucose or meal tests. Random effects meta-regression was applied to investigate whether BMI, age, HbA1c or fasting plasma glucose (FPG) could predict the size of the estimated intervention effects. We performed post hoc subgroup analyses for variables associated with inter-trial heterogeneity. We identified 1,120 potentially eligible references during the initial searches. After excluding duplicates and clearly irrelevant references, we retrieved 33 relevant references (flow chart for identification and selection of included studies in electronic supplementary material [ESM] Fig. 1). Of these references, 22 [20, 21, 22, 23, 24, 25, 26, 27, 28, 29, 30, 31, 32, 33, 34, 35, 36, 37, 38, 39, 40, 41] (29 datasets) fulfilled our inclusion criteria (trial characteristics are shown in ESM Table 1). The included studies were all published as full paper articles between 1996 and 2012. The patient characteristics (Table 1) and the diagnostic criteria for type 2 diabetes were very similar across trials. Total GLP-1 was measured by antiserum 89390 in 17 of the papers, by the RIA kit from Millipore (Billerica, MA, USA) in four papers [21, 22, 34, 36], and by the RIA kit from Phoenix Pharmaceutical (Belmont, CA, USA) in one paper . We received additional data that were not described in the published reports from five of the included trials [21, 29, 30, 31, 41]. The included studies reported total GLP-1 plasma responses in 14 OGTTs (one 25 g OGTT, one 40 g/m2 OGTT, four 50 g OGTTs, seven 75 g OGTTs and one 125 g OGTT) and 15 mixed meal tests (11 solid mixed meal tests and four liquid mixed meal tests ranging from 1,090 kJ [260 kcal] to 3,487 kJ [833 kcal]) (ESM Table 1). We performed a random effects meta-analysis including 554 participants (275 patients with type 2 diabetes and 279 non-diabetic controls) from 22 trials with 29 datasets. This random effects meta-analysis of plasma GLP-1 responses found that patients with type 2 diabetes and non-diabetic controls exhibited similar total GLP-1 responses when evaluated from peak plasma concentrations (weighted mean difference [95% CI] 1.09 pmol/l [−2.50, 4.67]), total AUC (tAUC) (159 pmol/l×min [−270, 589]) (Fig. 1), time-corrected tAUC (tAUC min−1) (0.99 pmol/l [−1.28, 3.27]), incremental AUC (iAUC) (−122 pmol/l×min [−410, 165]) (ESM Fig. 2) and time-corrected iAUC (iAUC min−1) (−0.49 pmol/l [−2.16, 1.17]). The regression analysis did not show any clear evidence of bias or small study effects (Egger’s test, p > 0.1 for all analyses). A repeat of the initial meta-analyses with fixed effects models confirmed the results of the primary meta-analyses, with the only exception that peak plasma total GLP-1 responses were higher in patients with type 2 diabetes compared with non-diabetic controls (1.79 pmol/l [0.07, 3.50]) (Fig. 2). Subgroup analyses showed increased responses after a liquid mixed meal test and a 50 g OGTT, and reduced responses after a solid mixed meal test, among patients with type 2 diabetes compared with controls (Table 2). Random effects meta-regression of the primary meta-analysis found no independent effects of age, BMI, FPG or HbA1c on any variables of GLP-1 responses with the exceptions that HbA1c predicted the outcome iAUC and FPG predicted iAUC min−1. Post hoc subgroup analysis, dividing the trials into two groups according to HbA1c levels (subgroup one: trials with mean HbA1c ≤ 7.5% [58.5 mmol/mol]; subgroup two: trials with mean HbA1c > 7.5% [>58.5 mmol/mol]), showed a negative influence of HbA1c levels on integrated incremental plasma GLP-1 responses (iAUC) (Fig. 3). The present study constitutes a systematic examination of GLP-1 secretory data from clinical studies and provides evidence that patients with type 2 diabetes, in general, do not exhibit reduced GLP-1 secretion in response to oral glucose or meal tests. Thus, the present data do not support the notion of a lower secretion of GLP-1 in type 2 diabetes, which was one of the incentives to provide exogenous GLP-1 as substitution therapy for patients with type 2 diabetes . It is unclear whether the reduced GLP-1 response, demonstrated in some trials, is secondary to the metabolic characteristics of the studied population or whether it represents random variation. One important reason for the controversy about GLP-1 secretion is probably that the most frequently cited papers, according to Web of Science, on GLP-1 secretion reported reduced secretion of GLP-1 [37, 39]. In these papers (the first papers to use a specific GLP-1 assay), blunted GLP-1 responses after a meal test were observed in older (>50 years), obese patients, with a fairly long (>49 months) history of diabetes and with relatively high (>8% [63.9 mmol/mol]) HbA1c and FPG levels (>10.8 mmol/l) [37, 38, 40]. Even though the results of these papers are not supported by our combined results, they are partially in agreement with our meta-regression analysis, which shows independent effects of HbA1c and FPG on iAUC responses. Furthermore, our post hoc subgroup analysis showed that increasing levels of HbA1c associated negatively with integrated incremental plasma GLP-1 responses (iAUC). In line with this, studies investigating newly diagnosed patients with type 2 diabetes and relatively low HbA1c often find normal plasma GLP-1 responses during OGTTs [21, 22, 26, 27, 28, 30], meal tests [29, 32, 33, 35] or both . Also, some studies, in well-regulated patients (HbA1c <7% [53 mmol/mol]) [20, 25, 34, 36] with a relatively short duration of type 2 diabetes (<48 months) [20, 34, 36] have shown increased GLP-1 responses after OGTTs [20, 36] or liquid meal tests [25, 34]. Indeed, in one of these studies, Theodorakis et al  showed increased numbers of L cells in the duodenum of newly diagnosed patients with type 2 diabetes as well as increased plasma GLP-1 levels between 20 and 80 min after a 75 g OGTT, which supports the notion of normal or even higher OGTT or meal-induced plasma GLP-1 responses in the early stages of type 2 diabetes. More recently, reduced GLP-1 responses have also been observed after OGTTs in mainly male, severely obese (BMI >35 kg/m2) patients with type 2 diabetes [23, 31]. A negative association between GLP-1 responses and BMI has been reported in some of the mentioned studies, which found reduced secretion of GLP-1 in patients with type 2 diabetes [31, 37]. However, when looking at the collective publications, as in the present meta-regression analysis, BMI was not found to be a determinant of GLP-1 secretion. Interestingly, our fixed effects meta-analysis that attributes less weight to smaller trials revealed higher peak plasma GLP-1 concentrations in patients with type 2 diabetes, and subgroup analysis showed increased responses after a liquid mixed meal test and after a 50 g OGTT among type 2 diabetic patients. These findings, combined with the negative impact of HbA1c and FPG on integrated incremental GLP-1 responses (iAUC) and time-corrected integrated incremental GLP-1 responses (iAUC min−1), may suggest that the GLP-1 secretion profile could change shape during the progression of type 2 diabetes. As a parallel to the insulin resistance-associated hyperinsulinaemic state in the early stages of type 2 diabetes (followed by insulin hyposecretion in the later stages), we hypothesise that compensatory L cell secretion of GLP-1 may exist in the early stages of type 2 diabetes, followed by L cell ‘exhaustion’ when the disease progresses and glycaemic control deteriorates, as suggested from in vitro and animal experiments . Nevertheless, it should be noted that fixed effects meta-analysis should be interpreted with care due to the large heterogeneity between the included trials; consequently, the study effect size differs not only by the number of participants in each study (sampling error) but also by other unaccounted variables. Thus, the notion of L cell exhaustion being part of the natural history of type 2 diabetes remains speculative. As mentioned, patients with type 2 diabetes have consistently been characterised by a reduced incretin effect. Our findings support the idea that a deterioration in GLP-1 effect, rather than GLP-1 secretion, contributes to this deficiency. Indeed, hyperglycaemia could lead to downregulation of GLP-1 receptor expression on beta cells and ‘GLP-1 resistance’ as observed in studies in rats . In support of this hypothesis, some of the included trials reported an impaired incretin effect despite normal GLP-1 secretion [20, 21, 26, 27, 30] in diabetic patients. These findings could have important implications for the design of new therapies based on activation of the GLP-1 receptor or other modulations of the GLP-1 pathways. The subgroup analysis was performed to improve understanding of the diverse impact of the different studies. As mentioned above, it showed increased GLP-1 levels after a 50 g OGTT (evaluated from peak plasma GLP-1, integrated GLP-1 responses [tAUC], time-corrected integrated GLP-1 responses [tAUC min−1]) and a liquid meal test (evaluated from tAUC and tAUC min−1) in patients with type 2 diabetes, whereas reduced time-corrected integrated incremental plasma GLP-1 responses (iAUC min−1) after a solid meal test were observed. The observed differences between liquid and solid meal tests could, at least in part, be due to variations in absorption of the nutrients in patients with type 2 diabetes. Indeed, delayed gastric emptying of solid meals, a frequently observed aspect of long-standing autonomic neuropathy in diabetic patients , might increase absorption in the proximal intestine, resulting in less food reaching the distal intestine where the GLP-1-secreting L cells are more numerous. By contrast, gastric emptying of liquid nutrients has been reported to be abnormally rapid in ‘early’ type 2 diabetes , and this could help to explain the observed increased plasma GLP-1 responses following an OGTT/liquid meal in the patients with type 2 diabetes included in the present study. Another explanation for the diverse GLP-1 responses among patients with type 2 diabetes may be rooted in the different drugs used to treat the disease. Indeed, metformin [43, 47] and bile acid sequestrants, like colesevelam , have been demonstrated to increase GLP-1 secretion. Thus, changing patterns in the use of glucose-lowering drugs during the past 20 years and different pre-study washout periods (from 12 to 72 h in 12 studies, and 3 weeks in the others) could bias results in favour of a higher or lower GLP-1 secretion in type 2 diabetic patients treated with these drugs. Thus, clearly, further studies are necessary to assess the impact of different glucose-lowering drug treatments on GLP-1 secretion. In the present meta-analysis, studies using non-specific assays that may cross-react with other proglucagon moieties, e.g. the major proglucagon fragment, were excluded. Nevertheless, one may suspect that our results could be affected by the fact that three different assays were used to measure total GLP-1 in plasma across the included studies. The majority of the studies assessed total GLP-1 by a highly accurate RIA (antiserum 89390) that is specific for the amidated C-terminal of the GLP-1 molecule and reacts equally with intact GLP-1(7-36)amide and the N-terminally truncated primary metabolite GLP-1(9-36)amide. This assay includes ethanol extraction of plasma to remove unspecific interference. Five studies [21, 22, 30, 34, 36] used different RIA kits, which may include reactivity towards GLP-1(7-37) and its metabolites, and where extraction is not performed. As a result, plasma levels may vary considerably between assays. In line with this notion, a recent study of available total GLP-1 assays showed that some assays measured higher levels while others measured lower levels in otherwise identical samples from patients with type 2 diabetes . Nevertheless, all three assays included in the present analysis have shown very low cross-reactivity with glucagon (<0.2%) and/or GLP-2 (<0.01%), and detection levels of ≤3 pmol/l. Importantly, all the studies included appropriate control groups of non-diabetic individuals. In 2011, Nauck et al provided a narrative review about GLP-1 secretion , which also included a meta-analysis (pooled estimates, random effects model) of ten studies (13 datasets) [16, 26, 31, 35, 36, 37, 39, 40, 41] comparing plasma GLP-1 responses (iAUCs) in patients with type 2 diabetes (n = 189) and matched healthy controls (n = 217) after an OGTT or a meal test. In the present study, we went further and performed both random and fixed effects models, besides evaluating inter-trial heterogeneity, meta-regression and subgroup analyses. Also, in addition to the incremental integrated responses of plasma total GLP-1 (iAUC) evaluated by Nauck et al , the present study includes data on peak plasma levels, integrated total responses (tAUC) as well as time-corrected integrated responses (taking into account the duration of the individual meal test/OGTT), providing a detailed analysis of several variables describing GLP-1 secretion following an OGTT and/or a meal test. Whereas our meta-analysis only includes data on plasma total GLP-1, the meta-analysis by Nauck et al  also included some data on plasma intact GLP-1 . Intact GLP-1 levels are indicators of the concentration of active hormone in the peripheral circulation available for signalling via the endocrine (blood-borne) pathway. Because active GLP-1 is subject to rapid degradation by the enzyme DPP-4 almost immediately upon its release (t 1/2 ~ 1.5 min) , only ~10% of intact GLP-1 actually reaches the systemic circulation , thereby reducing the possibility of detecting a small difference between responses in the peripheral circulation. Thus, studies evaluating ’GLP-1 secretion’ using intact GLP-1 assays are often compromised by readings below the lower limit of detection and by large variations in peripheral measurements; furthermore, intact GLP-1 assays have been shown to yield conflicting results due to high inter-assay variations . In addition, changes in intact GLP-1 concentrations during smaller meals or low-dose OGTTs are often undetectable . By contrast, plasma concentrations of total GLP-1 include any intact, active hormone plus the inactive primary metabolite of GLP-1 [GLP-1(9-36)], which is cleared more slowly from the blood (primarily through the kidneys) . Thus, total GLP-1 levels are better indicators of the overall secretory response. In contrast to the mentioned analysis by Nauck et al, we did not include separate datasets from studies that divided plasma GLP-1 responses into early- or late-phase responses (i.e. the two datasets from Theodorakis et al [0–20 min, 20–120 min]  and the two datasets from Vilsbøll et al [0–30 min, 30–180 min] ), but instead unified the results to provide overall plasma GLP-1 responses and to avoid duplicate analyses of data from the same study. Despite the methodological differences between the present study and the meta-analysis provided by Nauck et al , both analyses support the contention of preserved GLP-1 secretory responses to oral glucose and liquid meals in type 2 diabetic patients. We conclude that, in general, patients with type 2 diabetes do not exhibit reduced plasma total GLP-1 responses during oral glucose or liquid meal tests, as previously hypothesised. Nevertheless, deteriorating glycaemic control (high HbA1c) seems to associate negatively with plasma GLP-1 responses. We thank I. Shimomura  (Department of Metabolic Medicine, Graduate School of Medicine, Osaka University, Suita, Japan), J. Kozawa  (Department of Metabolic Medicine, Graduate School of Medicine, Osaka University, Suita, Japan), E. Ferrannini  (Department of Internal Medicine, Consiglio Nazionale delle Ricerche (CNR), Institute of Clinical Physiology, University of Pisa, Italy) and E. Muscelli  (Department of Internal Medicine, Consiglio Nazionale delle Ricerche (CNR), Institute of Clinical Physiology, University of Pisa, Italy), for contributing unpublished data from their studies for further analysis. SC contributed to the study design, researched the data, contributed to the discussion and wrote the manuscript. MC researched the data, contributed to the discussion, and reviewed and edited the manuscript. JJH contributed to the study design and discussion, and reviewed and edited the manuscript. BL contributed to the study design and the discussion, and reviewed and edited the manuscript. LLG contributed to the study design and discussion, researched the data, and reviewed and edited the manuscript. TV contributed to the study design and discussion, and reviewed and edited the manuscript. FKK designed the study, researched the data, contributed to the discussion, and reviewed and edited the manuscript. FKK is the guarantor of this work and, as such, had full access to all the data in the study and takes responsibility for the integrity of the data and the accuracy of the data analysis. All authors approved the final version.